With the Revolution of Halkidiki in 1821 many families, men and women, fled the area and went to Mount Athos in order to escape the slaughter and capture by the Turks. 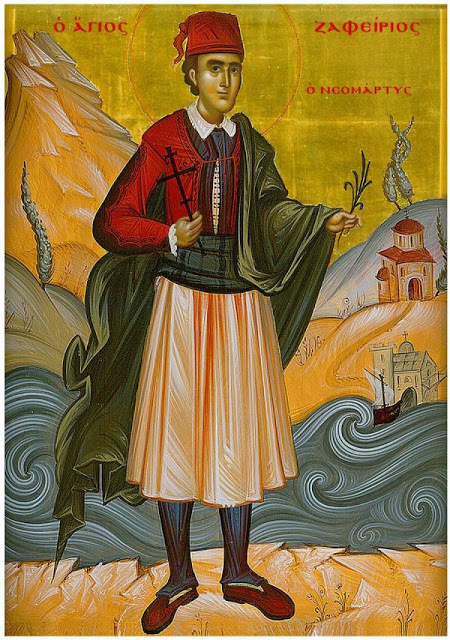 There were cases where the Halkidonians, who refused to change their Orthodox Faith, accepted the wreath of martyrdom, and among them was the young Zafeirios. As a teenager he was the only one of the young children taken from Mount Athos and brought to Thessaloniki that remained faithful to Christ. His exact place of origin is unknown, but certainly he was from one of the villages of Halkidiki. His Service (here) was composed by Athanasios Simonopetritis in 2011 and he is commemorated on June 11th. "On the Most-Holy Mountain of Athos around 1821, 1822, 1823, when Revolution erupted in Greece, Pasha Abu Bout of Thessaloniki came and captured the Mountain and much suffering occurred. Thereupon he sent his own men to the Mountain, gathered the found children, 70 in number, and brought them to Thessaloniki to make them Turks. Only one stood firm in the faith and was martyred, named Zafeirios." According to Monk Moses the Athonite, his memory, unknown in the Synaxaria, is honored with the Synaxis of the Athonite Fathers.